In journalism, the lede (rhymes with “need”) is the opening sentence, meant to draw the reader in and convey the essence of the article. When you leave the most important part of the story to the end of a piece, it’s called “burying the lede.” The other day, in writing about the opening of my gallery show, I didn’t just bury the lede, I cremated it: I left out the best part of the story. Now that I want to remind you about the event on Wednesday, December 8th (the folks from Just Food will be giving a little talk at the gallery—135 W. 29th St.—from 6-8; come if you can! ), I have a chance to set the record straight: my drawings (including the one above, which isn't in the show but is a favorite of mine) come from a bigger project—I have a book coming out in the spring about men who cook. 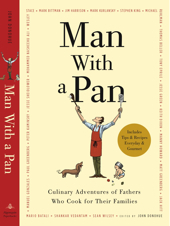 I’m very excited to announce that on May 17, 2011, Algonquin Books of Chapel Hill will be publishing “Man With a Pan: The Culinary Adventures of Fathers who Cook for their Families,” an anthology of recipes and essays by the likes of Mark Bittman, Mario Batali, Mark Kurlansky, Jim Harrison, and Stephen King. I came up with the idea for the book, edited the collection, and wrote the introduction. I also contributed drawings and cartoons to it. I’ll be posting more about the book over the coming months, but right now I’m under the gun to get the typeset pages back to my editor, and as a consequence I don’t have a great deal of time to blog about feeding my family. Of course, procrastination is as much a part of the writer’s art as is composition (an old friend and former roommate, who is an established author, used to clean the floor of the kitchen—with a toothbrush—when he was on deadline), so here I am. Everyone else in the food world seems to be preoccupied with Hanukkah recipes, but I don’t have any advice to offer (other than get invited somewhere for a meal—the brisket I had on Saturday night at my friend Betsy’s house was out of this world). The great cooking site Food 52, however, is on the case, and they have some suggestions, here. I’m concerned with more mundane tasks. Inspired by a passage in my book that I was working on yesterday (and fueled by my fourth cup of PG Tips tea in an hour), I decided to make chicken stock. It’s the basis for risotto and dhal, and it goes into my Insane Black Beans and my Bolognese. I ran out a few months ago, and needed to make more. I figured that stock could simmer for hours while I worked on the manuscript. Freezing what remains after making, eating, and picking a roast chicken is an easy way to ensure a supply of chicken bones for stock. My freezer was a disorganized mess, however, and it took me a good fifteen minutes of shuffling things around (and throwing out a few things we’ll never eat, such as a dozen egg yolks, left over from making meringues, and a vegetable soup left over from Santa Maria’s post-birth Weight Watchers days) to locate the carcasses that I needed. I spent the next fifteen minutes reorganizing things (something Mark Bittman has excellent advice about) and while I was knee-deep in frozen goods—bagels, chicken breasts, homemade soups and sauces—it occurred to me that there should be an annual event, along the lines of Open That Bottle Night, requiring that all home cooks clean out their freezer. One can only hope. In a large soup pot, briefly sauté the onion, carrot, and celery. Toss in the chicken bones. Cover the bones with water. Reduce to a slow simmer. Simmer for as long as you can manage, the longer the better. Strain out the bones with a colander. Strain the stock through cheese cloth to remove any bits of bones. Put the pot of stock in the refrigerator for at least a day. Remove the pot from the refrigerator. The fat will have congealed on top. Skim it off with a spoon and discard. Freeze the stock in quart containers.